There are thousands of species of animals, plants, fungi, and microorganisms in the Meadowlands, and many species are as yet unidentified (Kiviat and MacDonald 2004). Some taxa (evolutionarily related groups of organisms) in the Meadowlands have reasonable numbers of species compared to areas outside the Meadowlands that are less altered and urbanized (among those taxa are the birds), whereas other taxa in the Meadowlands are relatively poor in species (e.g., land snails, lichens). Also, some taxa in the Meadowlands have many introduced species (for example: vascular plants, land snails), whereas others (mammals, birds, butterflies) have species predominantly native to our region. Efforts to remediate contamination and water pollution, and to restore damaged habitats, are increasing in the Meadowlands. I hypothesize that the numbers of species overall, and the numbers of native species, will increase during the coming decades as environmental quality improves. A biodiversity monitoring program in the Meadowlands should track changes in biological diversity over time. The proposed program monitors butterflies and odonates (dragonflies and damselflies) at five locations representing a variety of habitats. 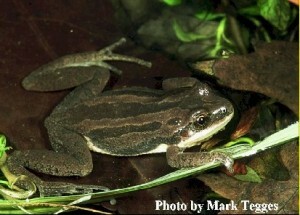 The program also monitors frogs at two sites. Diversity of most taxa in the Meadowlands is poorly understood and it is expected that some groups will have low, and some high, diversity. Expected improvements in water and air quality, and remediation of contamination, should gradually result in increased biodiversity at the level of native species. Temporal trends can not be detected in short term data sets (e.g., 3 years) or when the biota is sampled at the beginning and end of a period of years; many years of data are required to assess trends in a species or a community of species. The taxa proposed for monitoring, with the exception of a few of the dragonflies and butterflies, are organisms that stay in small areas and do not migrate, thus their populations are responding primarily to local environmental change in the Meadowlands. 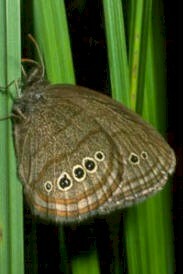 Even the migratory or nomadic butterflies and dragonflies require fixed local resources (nectar sources and insect prey, respectively). Urban areas present special challenges to biological study (Harrison and Davies 2002), and little research has been conducted on urban biodiversity in North America to provide a “baseline” for studies in the Meadowlands. 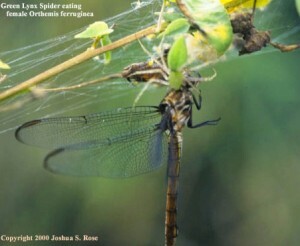 Urban insects, in particular, have not been well studied (McIntyre 2000). Therefore, the results of the first year of sampling (2006) will be evaluated as to the adequacy of sampling and the efficiency of identifying the organisms sampled. It may be necessary to change the sampling schedule (e.g., numbers of sites, numbers of samples, seasons, or taxa). All monitoring activities described below are proposed to be carried out annually. However, frequency of monitoring and other aspects of the monitoring methods should be discussed and if necessary modified after the first year of monitoring. Field sampling will be conducted by two trained individuals working together. I expect that most identification will be performed in the field, but specimens will be collected and consulting taxonomists will be employed as needed to assist with laboratory identification. Reporting on the proposed sampling program will include comparisons to the literature on biodiversity of the organisms sampled. The reports will also address the interest and value of “charismatic” and inconspicuous organisms alike to lay people as well as professionals.